The application of Operations Management can make the difference between success and failure for any organisation, whether it be in manufacturing, service delivery, supply chain, or any other industry. Some concepts of Operations Management are logical, self-explanatory, and even simplistic. However, when combined into business processes measured by cost effectiveness, they can be complex and demanding, and not always successful. 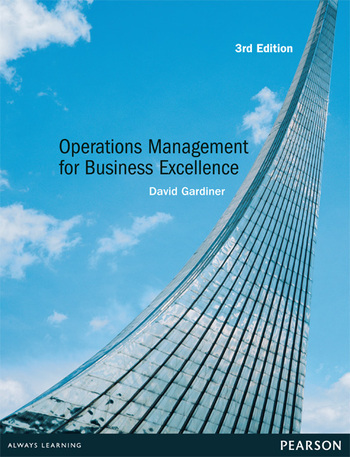 This new edition of Operations Management for Business Excellence provides an overview of the issues, introduces the concepts, and helps provide the solutions to achieving and maintaining "excellence" in business. It explains how to design and improve demand-driven processes to compete in business environments dominated by change. Nine new case studies - some from well-known international companies - add real-life experience to this new edition. Drawing on his many years of experience in the study and application of the topic, David Gardiner examines the topical theories of Operations Management and incorporates a prolific use of examples to elucidate the ideas in a meaningful way that practitioners, executives, academics and students can appreciate. Operations Management for Business Excellence is written primarily for postgraduate students who are studying Operations Management, or Supply Chain Management, as part of a business degree or diploma. It will appeal to undergraduates without previous exposure to the topic and those who do not require the rigorous mathematical approach of many Operations Management texts. Additionally, it would be attractive for practitioners to use with their clients as they endeavour to implement process improvement, resource management software, and other supply chain management applications. To use your Pearson VitalSource eText, download the VitalSource Bookshelf software to your personal computer, laptop or tablet. This software is free to download and use. After you have purchased your Pearson VitalSource eText access code you will receive instructions on how to redeem your code and download your eText.